Western Blot: Adenosine A1 R Antibody [NB300-549] - Analysis was performed on whole cell extracts (30 ug lysate) of PC 12 (Lane 1), SH-SY5Y (lane 2), U-87MG (lane 3), A549 (Lane 4) and K-562 (lane 5). Immunohistochemistry-Paraffin: Adenosine A1 R Antibody [NB300-549] - Analysis showing positive staining in the cytoplasm of Rat brain tissue (right) compared with a negative control in the absence of primary antibody (left). 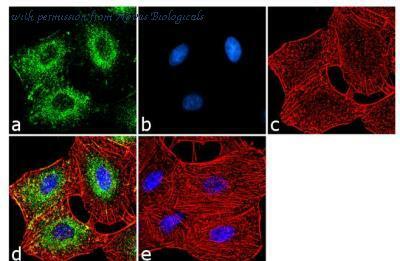 Immunocytochemistry/Immunofluorescence: Adenosine A1 R Antibody [NB300-549] - Analysis of Adenosine Receptor A1 was done on 70% confluent log phase HeLa cells. Western blot analysis of rat brain (lanes 1, 3) and rat kidney (lanes 2, 4) lysates: 1,2. 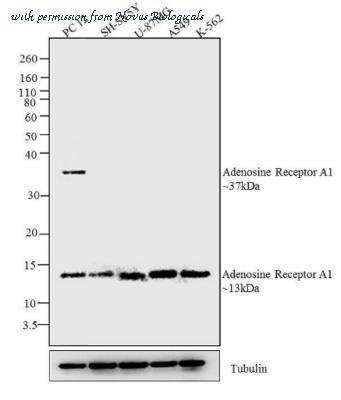 Anti-Adenosine A1 Receptor Antibody (#AAR-006), (1:200).3,4. Anti-Adenosine A1 Receptor Antibody, preincubated with the control peptide antigen.